Own a Personal Mobility Device (#PMD)? Keep them off the roads for a safer ride! You are at:Home»Electronics And Gadgets»Own a Personal Mobility Device (#PMD)? Keep them off the roads for a safer ride! From 15 Jan 2018, the LTA will strengthen regulations on the use of PMDs in Singapore, and tougher penalties will be carried out on PMD users caught riding on roads. 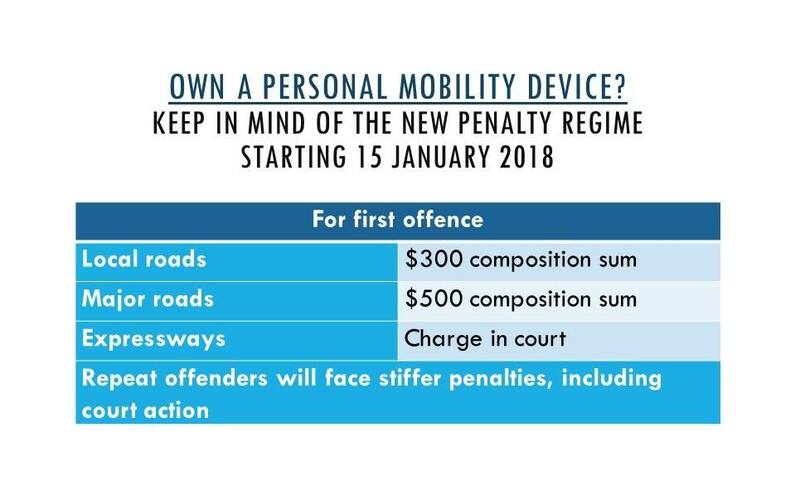 To deter errant riders, first-time offenders will face a higher composition sum of up to $500 for riding on major roads, and those caught riding on expressways will be charged in court. If convicted in Court, first-time offenders can face a fine of up to $2,000 and/or 3 months jail, while repeat offenders will face stiffer penalties. Check out the infographic below for more info. Previous ArticleE-BIKERS STILL RIDE ON THE ROAD DESPITE LAWS PROHIBITING THEM FROM DOING SO! Next Article 880,000 HDB Households to receive GSTV – U-Save Rebate in January 2018!